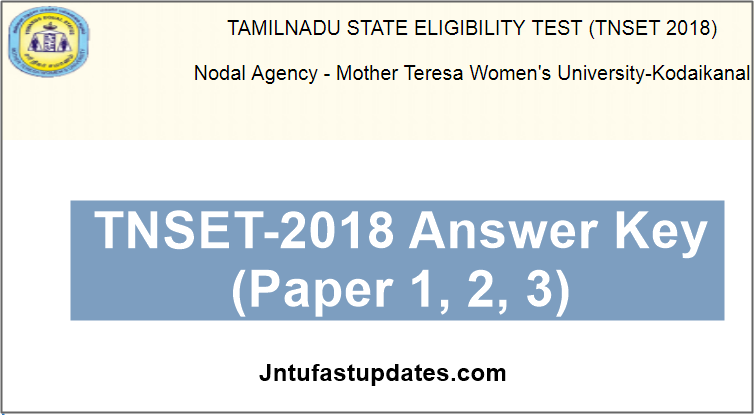 TNSET 2018 Answer Key: After the examination of Tamilnadu SET (TNSET) 2018, the answer key for Paper 1, Paper 2 & paper 3 will be displayed on tnsetexam2018mtwu.in. Tamil Nadu State Eligibility Test (TNSET) was held on 4th March across the state of Tamil Nadu. Many of the applicants seeking to become assistant professor and lecturer in the state have appeared for the examination. Mother Theresa Women’s University has conducted the TN SET examination for all applicants. Many of the aspirants seeking to get Lecturer/Assistant Professor in the state of Tamil Nadu SET examination. The State Eligibility Test (SET) has been conducted in 27 various subjects. All the applicants those have appeared for the state eligibility test can download the answer key to check whether their attempt is good or not. By analyzing the answer key, candidates can know the likely score they get. Competitors can download TNSET answer key PDF for all sets A, B, C. D. Candidates can compare with the corresponding set to estimate their probable score in the examination. Visit the official website, tnsetexam2018mtwu.in to download the answer key. Tamil Nadu State Eligibility Test is shortly called as TNSET. This examination is conducted by Mother Theresa Women’s University in the 27 subjects for the recruitment of Indian Nationals to fill up the vacant posts of Assistant lecturers in Universities and also in Institutes of Higher Education as well as colleges in Tamil Nadu and also in Union Territory of Puducherry. The Tamil Nadu State Eligibility Test has been conducted for lakhs of interested aspirants. All the competitors who have competed for the TN SET examination can download Tamil Nadu SET Answer sheet 2018 PDF from the official website. The official TNSET answer key 2018 will be released after 3 to 4 days after the examination. Candidates can download official answer sheet/question paper solution from the official website, tnsetexam2018mtwu.in. After the examination of TNSET 2018, the answer key for all the papers will be displayed on the website: www.tnsetexam2018mtwu.in Candidates can send their grievance along with documentary evidences within 15days after the publication of answer keys for all the papers to tnsetexam2018@gmail.com. After expiry of 15 days time, no grievance regarding answer key will be entertained. The grievance will be addressed by experts, and the final/ amended answers keys will be uploaded on the website: www.tnsetexam2018mtwu.in. As amended answer key given by experts is final and binding, no further clarification will be permitted. Candidates may challenge only the shaded answer in the answer sheet (OMR) for clarification by paying a sum of Rs.1,000/- per question in the form of SBI- Demand Draft. The decision of the Mother Teresa Women’s University shall be final in all matters. Candidates who are eager to check the answer sheet immediately can check the unofficial answer key from various sources. The TN SET unofficial answer sheet will be accessible on various coaching institutes websites. All the coaching centers offer the answer keys. So, as aspirants can tally their answers with the official answers to estimate the score. Career launcher, Paramount, Made Easy and other coaching centers are going to provide the answer sheet soon after examination. Candidates can download the answer keys from these websites until the official answer key is released. While it is important to download the official answer sheet ultimately to check the perfect answers. Stay visiting the official website, tnsetexam2018mtwu.in to download the official answer key. How to Download TNSET 2018 Answer key for Paper 1, 2, 3 at tnsetexam2018mtwu.in? Finally, your TNSET Answer Key 2018 will appear. You can take a Print Out of the Answer key in the PDF Format and verify your answers with this TNSET 2018 official answer sheet. The result of the TNSET 2018 Examination held on 04.03.2018 will be published on the Website: www.tnsetexam2018mtwu.in for authenticated view by candidates who have been admitted for the exam. Only qualified candidates will receive intimation through SMS. 1.3 How to Download TNSET 2018 Answer key for Paper 1, 2, 3 at tnsetexam2018mtwu.in? After the amended ans key in paper 1 i got 21 CRT and in paper 2 igot 47 qus. Crt for maths. please sent paper 1 question paper. First Paper is more then passage Question. So, do not get enough time for reading the questions. Because, pls reduce the cut off marks sir. I got 26 correct in paper 1 and 50 correct in paper 2. My major is Electronics . I am under BC Category. Is there a chance to pass? Paper 1 is very bad sir.do not get enough time for reading the qstns.wt logic sir for adding more coprehension qstns.tatal one hr.10 minits lost due to omr preparation.pls reduce the cut off marks sir.